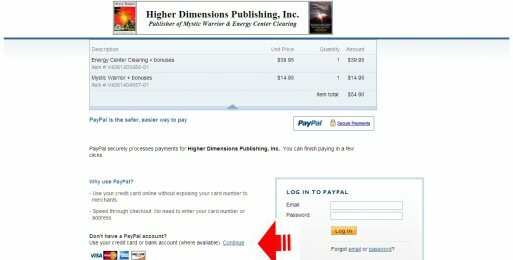 Claim Your Copy and Bonuses Now! Paperback Book Yes! I want to submerse myself in a world of possibility that truly inspires me! Send the award-winning, visionary thriller Mystic Warrior (paperback book) plus a mind-bending bonus to me right now for only $14.95 plus shipping & handling or choose one of the other options on the right. Paperback Book Yes! 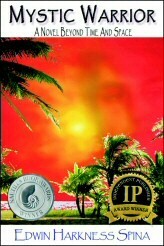 I want 53 powerful keys to spiritual growth and personal development. Send Mystic Secrets Revealed (188-page paperback book) for only $14.95 plus shipping & handling or choose one of the other options on the right. Yes! I want to relieve stress, calm my mind, boost my energy and connect with my innermost self for peace, balance, clarity and healing! 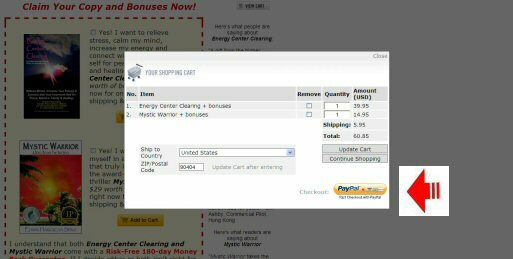 Send Energy Center Clearing plus $151 worth of bonuses to me right now for only $39.95 plus shipping & handling or download everything for only $39.95 with no shipping and handling charges. Yes! I want to immerse myself in absolute, unconditional, infinite, divine love. 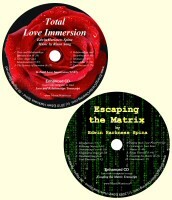 Send me the Total Love Immersion CD (includes the Love and Relationships Audiobook) plus get an Escaping the Matrix CD for only $19.95 plus shipping & handling or get the download version of everything for only$19.95 with no shipping and handling fees. I understand that all physical products come with a Risk-Free 180-day Money Back Guarantee. If I decide they are not right for me, for any reason (or no reason) I can send them back at any time within the next 180 days for a 100% refund, which will be honored instantly. You’ll be taken to the PayPal Secure Order Page. If you don’t have a PayPal account, just click the Continue link where the Visa, MasterCard, Amex and Discover logos are displayed. (The red arrow is pointing to it in the image below). You’ll be able to use your credit or debit card to place your order with the 100% secure PayPal system. Orders are shipped using First Class or Priority Mail. You will receive an email notification upon shipment.